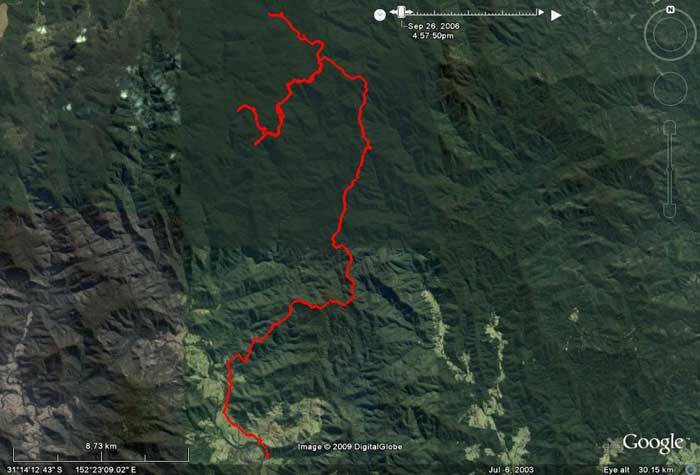 Day Three - Brushy Mountain Camping Area is near top and the Forbes River that we could not cross was the very top. The Forbes River where we camped is at bottom. Plateau Beech Camping Area is far left and the tree that blocked our route was the little red bit pointing south-west. 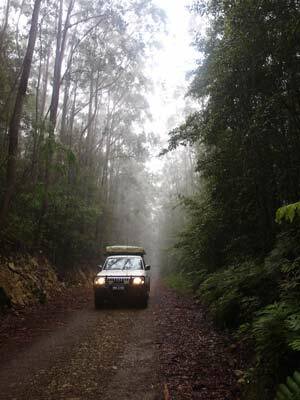 We get up late this morning as the plan is to only travel a short distance to the Moorabark Camping Area in Werrikimbe National Park. It rained constantly all through the night, but nowhere as heavy as the past two nights. Once we are up, we have a leisurely breakfast in the shelter hut and during a short break in the rain, I go for a walk. There are a number of walking tracks that start at the camping area. I decide to walk to the Grass Tree Picnic Area that is said to be something like 500 metres away. The track starts at the creek next to the camping. I later realise that the "creek" is in fact the Forbes River (see later). As I cross the small bridge, I can see how much water flowed over it two nights ago, causing the flooding of the camping area. It is about 300 metres to where the river loops back and heads in the opposite direction. Just before here there is an intersection with no sign. Which way is the picnic area? I walk down to the river and see that the water has damaged the low level bridge a bit and that there are some huge trees pushed up against rocks and trees just before it. Must really have been a lot of water. When I get back home, I have a look at the topographical maps for this area and figure that the catchment for the river above the camping area is really quite small. A huge amount of rain must have fallen for the flood that came across it to occur. As I have no idea which way the picnic area is located and it is now lightly raining, I head back. Eventually, we have another small break in the rain so we pack up and depart at 11:10 am. We decide to go and have a look at the Plateau Beech Camping Area. This is located off the last road we passed last night on the way in. We backtrack the two kilometres to the Cockerawombeeba Road intersection. 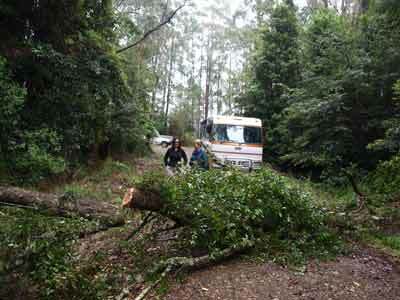 We see a large tree is across the Hastings Forest Way about 30 metres from the intersection. We decide that we will call in to the Brushy Mountain Camping Area on our return past it and warn Alan of this. It is about 6.5 kilometres to the turn off to Plateau Beech Camping Area and a further 3 kilometres down to the camping area. It is a very nice camping area with a huge excellent grassed area (could fit 40 tents I reckon) and large shelter shed. 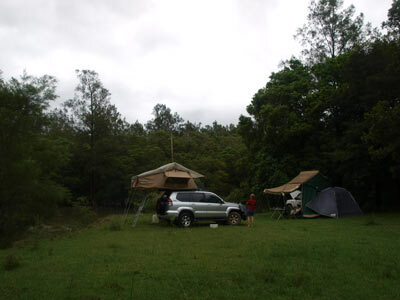 However, it is totally unsuited to caravans, camper trailers, motor homes and vehicles like us with roof-top tents. This is because vehicles cannot leave the parking area which has no flat area at all. A pity that the flatter section does not have a track into it and some small bays. We backtrack again towards Brushy Mountain Camping Area as we want to head in the opposite direction to that which we have come so far. When we get back to the intersection with Hastings Forest Way, we see that Alan has already left and is stopped at the fallen tree. It is 12:10 pm and it is only very lightly drizzling. When we get out to help him, we see that he has already almost chopped through the tree's main branch with his axe. This is on the upper side of the road. He is planning to use his winch to then drag the tree off the road. His plan is to wrap it around a tree on the lower side of the road and pull the tree away from him. We offer to help. Ron has a shackle and I get a tree protector. This makes it a lot easier, as well as protecting the tree from ringbarking from the winch cable. Alan's huge 14 tonne winch easily pulls the tree off the track. We say goodbye again and head west. A little past the Brushy Mountain Camping Area we cross a small creek. 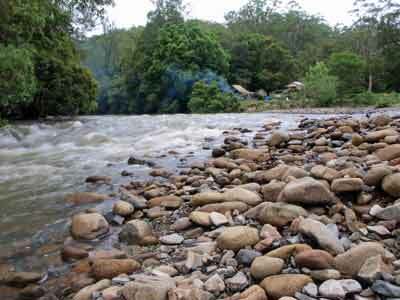 I know that this is the creek that goes past the camping area and later realise that it is the Forbes River. About 2.5 kilometres past the camping area we again come to the Forbes River. Here it is flowing very fast and is obviously much deeper than where we crossed it a few minutes ago. It is now 12:38 pm. Ron starts to walk across but soon the water is up to the bottom of his shorts. I strip off and put on my Speedos. I walk across the downstream side of the river and it is up to my waist. Not too bad. However, I can see that the upstream side (right side as we look at it), is much deeper. It comes to my chest. This in itself is not too deep, as I have crossed creeks and rivers this deep before (see our Victorian Alps trip of two years ago). However, the bottom on this side is very rocky, with some large boulders make it possible that we could get hooked up. If we could get far enough over to the left it would be okay, but this is not possible. I exit the water and compare the depth on my body with the car. It is about level with the bottom of the front of the bonnet. After some discussion, we decide it is too risky to attempt. We turn around and go back to the Grass Tree Picnic Area which is back over the first crossing of the river. This appears to be abandoned, as there are bollards across what appears to be the entrance, although there is a missing one that would let you in. However, when I walk in and have a look, we see that it is not worth using as there are no facilities at all. It is now 1:05 pm so we decide to have lunch here. Over lunch, we decide to go back down Cockerawombeeba Road to the Oxley Highway and then come in off the highway to Moorabark Camping Area. At 1:50 pm we leave. We head down the road back towards Plateau Beech. 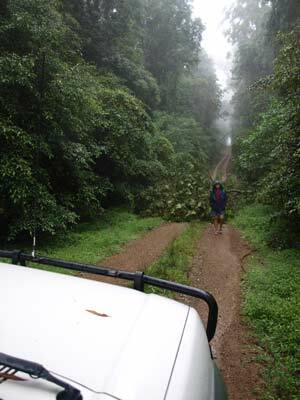 We pass the access road to the camping area and 7.1 kilometres from the Hastings Forest Way we come to a huge tree blocking the road. This one is a problem. 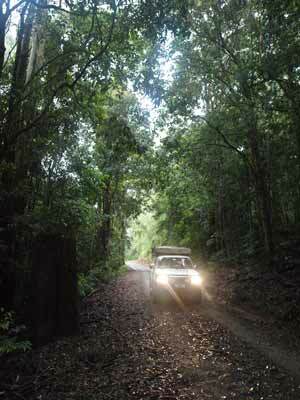 It has so many branches, it will take us well over an hour to cut them all and then more to haul them off the road. Now it is to Plan C. We will use Forbes Road to get to the highway. Forbes Road means going the 7.1 kilometres back to Hastings Forest Way and turning east. Another 6.8 kilometres down the road we take Forbes Road. 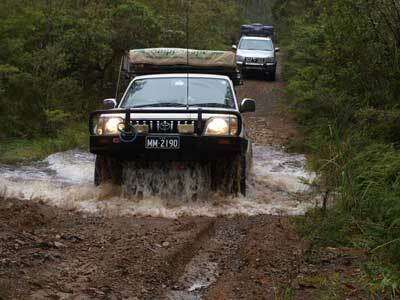 This is not too bad a road, but not as good as the roads we have been on. It is a lot more slippery. We pass a number of vehicles heading in. One tells us they tried to cross the Forbes River yesterday on motorbikes and his brother got washed off his bike and they had to rescue him. Another tells us they tried to come up Cockerawombeeba Road and were stopped by a tree. It was the same one we encountered. We also get told about a couple and their kids camped at the bottom of the hill ahead. We decide that as it is now getting quite late and the rain has started again, it would not be wise to head to Moorabark Camping Area as it has to be at least a two to three hour journey from here. We decide to have a look at where the family is camped. At 4:30 pm we arrive at the spot where the family is camped. This is on private property and is at the intersection of Forbes River and a creek (GPS S31º 20' 07.1" E152º 20' 34.4" using WGS84 as a datum). I go and speak to the father. He tells me that it is okay to camp here and that there is a pit toilet across the road. We have a look and decide to stay here. The family is camped on the higher level but lower down there is a very nice grassed area (watch out for the cow pats). We set up camp during a short break in the rain. This is quite nice, with the raging Forbes River making a very loud noise as the water rushes down towards the Hastings River. It starts raining again and continues virtually all evening except for a couple of short breaks. It is not heavy, more a fine drizzle. I get a fire going as Kelly and I are making pizzas for dinner. We have a lot of timber and I soon have a roaring fire going. We cook the pizzas in our camp oven (see pizza recipe on Victorian Alps page). We set about preparing the fillings for the pizza and making the dough. We roll out three bits and also make a small loaf of bread which I put on first as an entree. About 7 pm I put the first pizza on and seven minutes later it is cooked. We have half of this pizza before cooking the next one. This is repeated. The left over pizza is wrapped up and becomes lunch for coming days. We read after dinner and then head to bed.